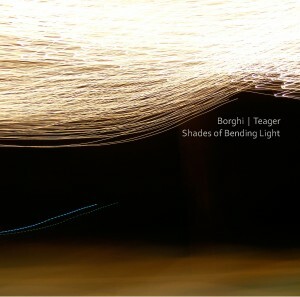 Shades of Bending Light is Matt Borghi & Michael Teager’s second studio recording and the follow-up to 2013’s critically-acclaimed Convocation. Recorded in one take without overdubs, Shades… shows the synthesized guitar and saxophone duo venturing deeper into their “jambient” style which brings together improvised ambient soundscapes from musical ideas created on the spot. Building upon the momentum and trajectory of Convocation and Awaken…, this album features more involved melodic and rhythmic interplay between Borghi & Teager. Fans of Tangerine Dream’s Phaedra, Vangellis’s Blade Runner soundtrack, Jeff Beck’s Blow by Blow, and Tortoise will immediately recognize these influences on Shades of Bending Light.